Erica Bunker | DIY Style! 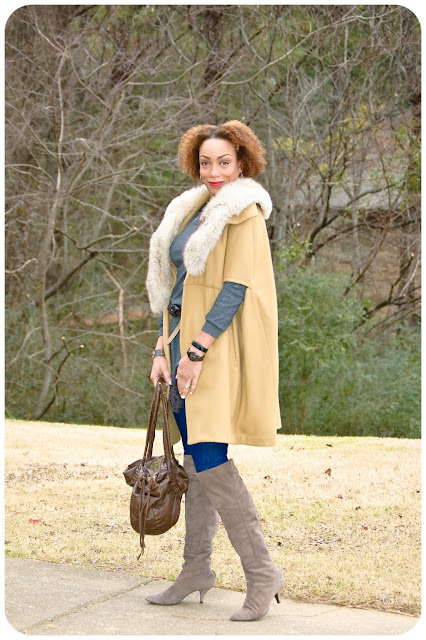 The Art of Cultivating a Stylish Wardrobe: Mixing Neutrals: Camel & Grey! All of this chilly weather we've been having has given me plenty of opportunities to parade out all of my DIY coats! And this cold Monday morning was no different. I was throwing on this Grey v-neck tassle sweater c/o Shein.com with jeans and boots. It was already pretty cloudy this morning. So I added the camel cape to give my shades of grey and denim some "brightness". And another thing I've notices is that camel outerwear is so classic that it just makes everything look expensive. A fur collar is always a great way to update or spruce up outerwear. Styling tip: My neutral color palette also allowed me to play with different shades and texture. My Camel Cape is Vogue 8776; vintage fox fur collar from my grandmother; jeans are my 2nd pair of Kendall Skinnies. Erica, You are so right about Camel! Swooning over your cape, as I am desperately scouring sewing land and e bay fir Vogue 8776. Yours looks totally fabulous with my other favourite...fur. You are rocking that camel and grey combo. Beautiful! Love the whole look and of course the fur collar on the cape! How did you get it to stay? I have a vintage fur collar but want to make it detachable without seeing the hardware once the collar is off. Am I asking the impossible? Thanks! I just pin it on. Thanks Fauxgetaboutit! All I can say it you look amazing!!! Fit looks good in clothes.